When help is needed, they are first to answer the call. Every day, first responders are there in times of need. Whether saving lives, responding to emergencies or helping individuals and communities recover, they are trained to make the right decisions in critical situations. Not surprisingly, the events and experiences of being a first responder can take a toll on mental health and well-being and impact the lives of everyone around them, including spouses, children, colleagues, friends and family members. The BC First Responders Mental Health Committee was established in 2015 as a multi-agency group, to work collaboratively to provide cross-organizational leadership and recommend practices that promote positive mental health for first responders across the province. Members of the committee include both labour and management representatives from First Nations emergency services as well as law enforcement (including RCMP, Canada Border Services Agency, and municipal and transit police), the fire service, ambulance and emergency health services from across the province. “One of the first priorities of the committee was to create a repository of information, supports, and resources to provide first responder organizations with a well-developed starting point for addressing mental health issues,” explained Rondou, who is chair of the committee. “The resulting website, bcfirstrespondersmentalhealth.com, provides a central inventory of resources that allows for sharing of knowledge, resources, and training across first responder agencies.” Another priority was tackling the stigma that still exists in many first responder organizations. To that end, the “Share It. Don’t Wear It.” anti-stigma campaign was created. Members of the BC First Responders Mental Health Committee were also pivotal in having Post-Traumatic Stress Disorder (PTSD) and other mental health disorders included in the list of presumptive conditions associated with frontline responder work within the Worker’s Compensation Act. The BC Government has showcased the work of the committee across Canada and its work is now being duplicated in other provinces. Keeping first responders healthy contributes to public safety. 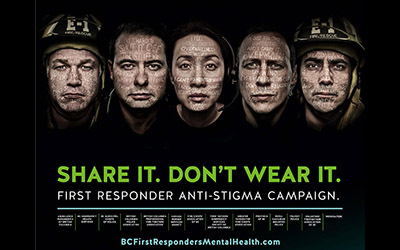 As the primary training and education provider for recruits in the province, this is an important area of advocacy for the Justice Institute of British Columbia (JIBC) and the BC First Responders Mental Health Committee has developed and shared resources with JIBC programs to increase awareness of mental health and the resources available to new recruits as they enter their professions. On November 15, 2018, The Justice Institute of British Columbia Foundation will award the BC First Responders Mental Health Committee with the Dr. Joseph H. Cohen Award in recognition of its outstanding work to increase awareness of and support for positive mental health among first responders. The award, established in 1998 to honour a founding Governor of JIBC, recognizes a passionate desire to help others and in doing so, provide leadership in the pursuit of public safety. The Gala will recognize individuals and groups committed to impacting lives through justice, public safety, and community leadership; celebrate 40 years of JIBC, Canada's leading public safety educator; and raise funds to support student success.